Tablet locks, charging cabinets & more! Discount iPad holders on Sale! Looking for iPad holders for in-store, trade show, and business display? 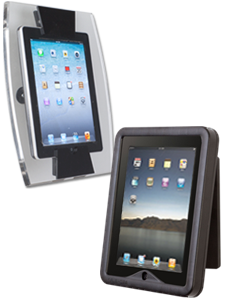 Our Apple and Android tablet stands or mounts are designed to withstand heavy commercial use in high traffic areas. 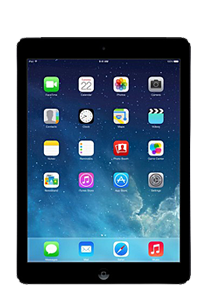 Businesses and organizations across all industries use Apple® devices and Android tablets in a wide variety of ways to impact both sales and operations. Commercial quality iPad holders, also called interactive tablet display stands for business, are available in styles designed for customer use, styles for staff use, and as models that can be accessed by both consumers and internal employees alike. From simple freestanding wayfinding or information stations to countertop point of sale checkout systems to overhead multimedia advertising to custom "build your own" consumer apps for everything from pizza to cars, the handheld touchscreen device has become the go-to computerized accessory for almost every industry and organization. 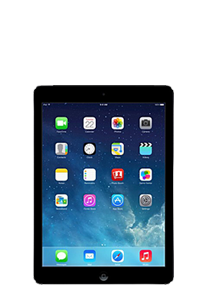 iPad holders for business help sell goods and services, help customers make informed selections, allow them to view stock and availability information, select from menu options, check in and out of hotels, and much more. Customized apps and advertising programs help turn Apple and Android tablets into multimedia players for digital advertisements and marketing messages as well as small scale replacements for traditional television or monitor screens. 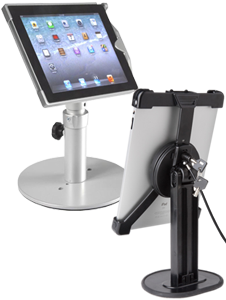 iPadHolders2go.com maintains a huge inventory of touchscreen kiosks, stands, and mounts that is constantly updated to ensure our customers have instant access to the most current models as well as classic device display fixtures. What are the different tablet display and enclosure styles for business, commercial, or educational use? Every day, more and more businesses increase their use of handheld devices and multimedia applications. As technology and programming continue to evolve, so do the tablet holders that present and protect these invaluable pieces of personal technology while allowing staff, customers, students, and management to access information as needed. Touchscreen enclosures and displays have evolved into an array of styles, each one more innovative than the next, to accommodate the many uses across commercial and business establishments, schools, professional services, and special trade show or event environments. Specialty features such as locks, rubber-lined brackets, and charging ports allow savvy retailers, entrepreneurs, and educators to match Apple and Android device enclosure designs to the exact features needed for any commercial, educational, or professional business display. What are the most common uses for touchscreen tablet holders in commercial and business environments? Point of sale transaction terminals and other customer/staff interactions - Handheld devices are easily used with POS software for instant or self-payment countertop kiosks. Many designs are radio allow the display stands to pivot, twist, or flip between customer facing and staff facing for efficiency. In-store customer self-service and customization stations allow retail or professional service staff can tend to in-person business while customers engage with merchandise virtually using these secure holders placed strategically on sales floors, in showrooms, hotel lobbies, and in restaurants. Schools, galleries, and organizations use counter top or wall mounted display stands to access card catalogues, exhibit information, and membership lists. Advertising, sales and marketing presentations - portable desk or counter top tablet holders are perfect for showcasing in-store promotions as well as in-office presentations. This type of showcase is ideal for drawing attention to price and product merchandising specials or creating product and service demonstrations. 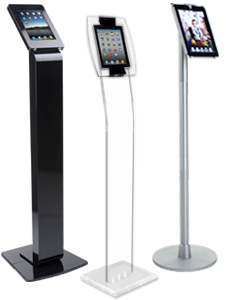 Search and wayfinding information for businesses, hospitals, office buildings, transportation terminals, and campuses is frequently presented on freestanding display stands for Apple or Android devices. Many convention centers and trade show halls, as well as schools or businesses, opt for podium-style furniture with built-in device enclosures for use with speech or lecture notes, classroom lessons, or multimedia presentations. Easy access kiosks are very effective when used for in-office and in-store customer communication and feedback, social media updates or check-ins, reviews, surveys, and mailing list sign up. Businesses choose floor standing, countertop or even wall-mounted device mounts that offer maximum visibility and accessibility. The variety of commercial uses for Apple, Android, Mini, Air, Android, Galaxy, surface, chromebook, e-reader, kindle, nook, notebook, and even smartphone devices is nearly limitless. Depending on the style of device mount, touchscreen access can allow either active OR passive interaction and engagement. From offering multi-function kiosks to streamlining customer service, commercial grade POS tablet counter stands and tablet mounting systems are designed to offer the widest possible selection of accessibility, security, connectivity, and mobility options to meet the needs of an ever-growing marketplace. Today's retailers, service businesses, educators, and commercial operations and stores utilize touchscreen mounts and covers to implement their own tablet programming and custom apps as well as pre-programmed offerings. Security is a major factor for designs used by customers or in public locations; however, functionality and ease of use are also extremely important to every model. 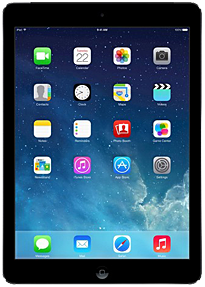 Whether a touchscreen display is intended for commercial, professional, or education environments, tablet enclosures can properly and securely showcase Apple® devices in any setting. iPadHolders2Go is home to an ever-increasing variety of tablet display stands, kiosks, mounts, cases, covers, holsters, and accessories. 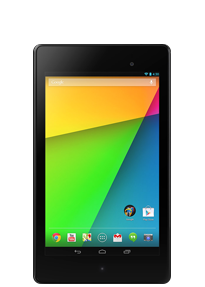 By constantly adding to our selection, we are able to keep up with changing commercial tablet usage needs as well as accommodating even the newest Apple and Android hardware and supplies. For a full description of our product lines, please visit our site directory.